I follow some amazing fashion illustrators on Instagram and I wanted to share a few of them with you. They have a wide variety of styles and use different mediums from watercolor and ink, to gouache, pastels, and digital. In no particular order, here are ten of my favorites. Let me know in the comments if you have any to add! Jennifer predominantly illustrates digitally these days and can be found illustrating red carpet looks, the royal family, through to some of our feminist heroes such as Ruth Bader Ginsburg. She has a cute, lovable style that always feels fresh and modern. Lydia is a UK-based illustrator who mostly draws digitally but still maintains a sense of traditional artwork in all of her pieces, with ink splatters, watercolor backgrounds and soft pencil lines. Jill creates wedding and fashion illustrations with bold, minimalist lines, giving a striking and modern feel to her work. Flavia’s style is whimsical and adorable, whether she’s using bright colors or sticking to monochromatic pieces. She illustrates both digitally and traditionally and is based in the UK. Make sure to check out her outfit of the day series. Angie is based in Melbourne, Australia and both illustrates and teaches fashion illustration. She primarily illustrates using traditional methods and her work has a wonderful balance of detail and suggestive elements. Alina is a Russian-based illustrator whose wonderful use of color and playful expressions will have you scrolling and scrolling through her account. She primarily illustrates digitally, and her work always has a polished and professional feel. Julia’s illustration is soft and romantic. She predominantly illustrates in pencil and adds an incredible realism and level of detail to all of her work, often with bold pops of color. 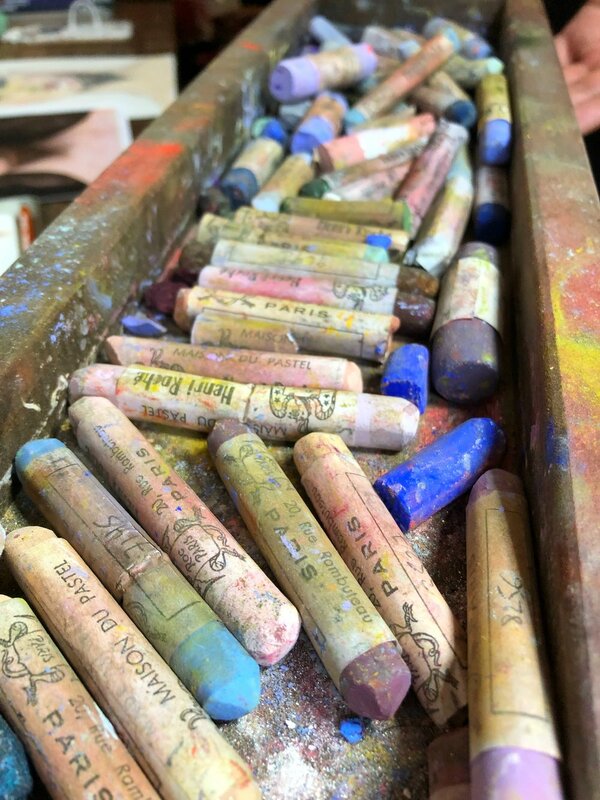 Katie is based in New York, and works in a variety of mediums from pastel, to watercolor, to digital, to found objects. Her style is dreamy and romantic, while still being rich and colorful. Check out her account for wonderful studio and behind-the-scenes images as well. Alison’s illustrations are always modern and filled with life. You’ll see soft spots of color and bold lines in her work. She has a wonderful range of greeting cards and other products too. Meagan travels frequently and her fashion illustrations will transport you to the location that inspired them. Her work is bold, colorful and thoroughly enjoyable! Jessica’s illustrations are bold and modern. Primarily created digitally she always has a great sense of movement instilled in her work. If you’re not already following me on Instagram, here’s where you can find me! I’m a Seattle-based fashion illustrator and I primarily paint ink or watercolor fashion illustrations. I have a love of bright colors and whimsical styles. I create fashion illustrations for brands, social media, packaging, and live events. The 100 Day Project is designed to make creativity a habit. The theory is that if you can do something for 100 straight days it will be easier to keep doing it after that. So each April, hundreds of thousands of artists, photographers, and other creatives pick a theme or project for themselves and start creating. For 2018 my project is 100 Days of Flowers and Faces (because I couldn't choose between the two). I'm creating them in all manner of styles and using lots of different media from acrylic paint to markers, colored pencils, and collage. Leave me a comment and let me know if you're doing The 100 Day Project this year, and if you are, what you theme or project is! 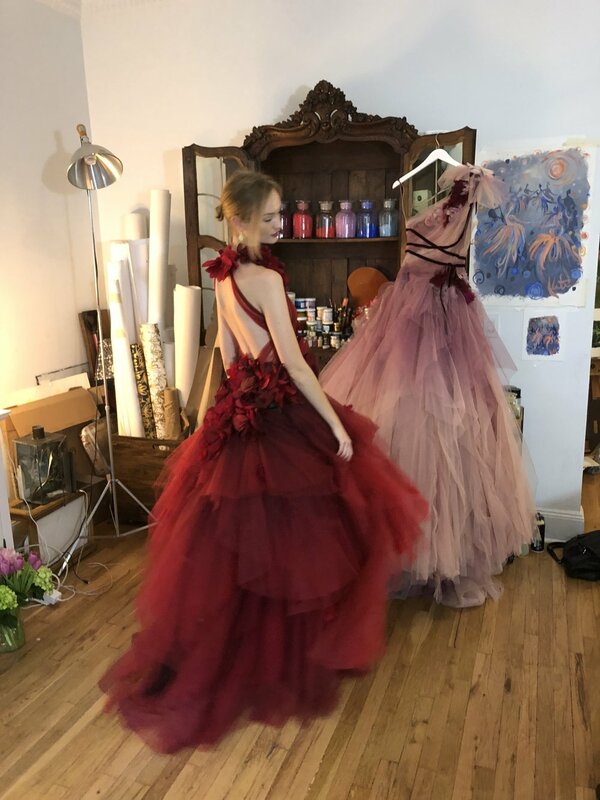 A couple of weeks ago I did some live fashion illustration sketching and painting at the Lincoln Center's ArtWear event. 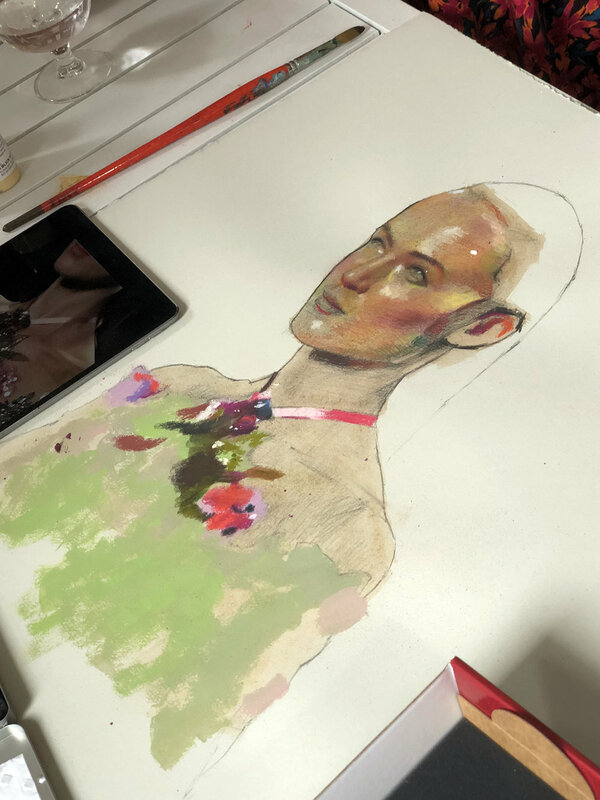 I started my painting during the VIP cocktail function, then watched the runway show, then continued working (while also taking requests for individualized fashion illustrations on my iPad) during the shopping event. It was such a fun night, and I'll update this post with the finished painting once I've added some final touches. Here's one of the iPad sketches I did during the event. That's our city's town center behind her in the illustration. All photos are courtesy of Grant Smith. I've been working away at the drawings for a few weeks now, doing the original designs in my sketchbook or on marker paper and then recreating them as digital vector files to be put into the app. I did a mix of shoes, fashion and style table-top layouts, and a couple of lovely ladies. The app is free to download and you can color the first page of my book (and free daily pages) without a subscription. Or subscribe and get access to over 2,200 coloring pages! 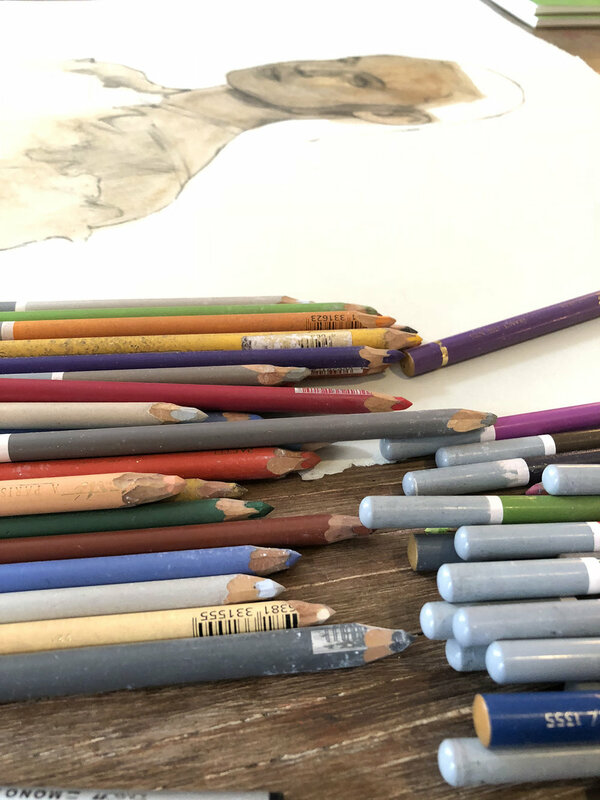 People have already started sharing the pages they've colored and it is so much fun to see how everyone interprets the designs differently and chooses different tools and color palettes. Leave me a comment and let me know if you ever spend time coloring to relax (traditional book or a coloring app). I’ve participated in ‘Inktober’ for a couple of years now, and it is always SO much fun! I love seeing how creative people can be using only ink. This year I’ve primarily been using Tombow Dual Brush Pens and their blender, with a paintbrush so I can paint the ink on as if it was watercolor. I’ve been having a lot of fun testing out some different techniques. After I put down my color I’ve been using Mono Drawing Pens for outlining. I’ve also done all shoes so far, although I’m planning on branching out a little as the month progresses. Are you doing Inktober, and if so are you using the official prompts or doing your own thing? You can make this watercolor-look planner dashboard in around five minutes, it's super easy! It's a great way to divide up your planner, add a new section, or store your sticky-notes or washi tape! An image printed onto watercolor paper. You can use this one that I created, or draw your own. 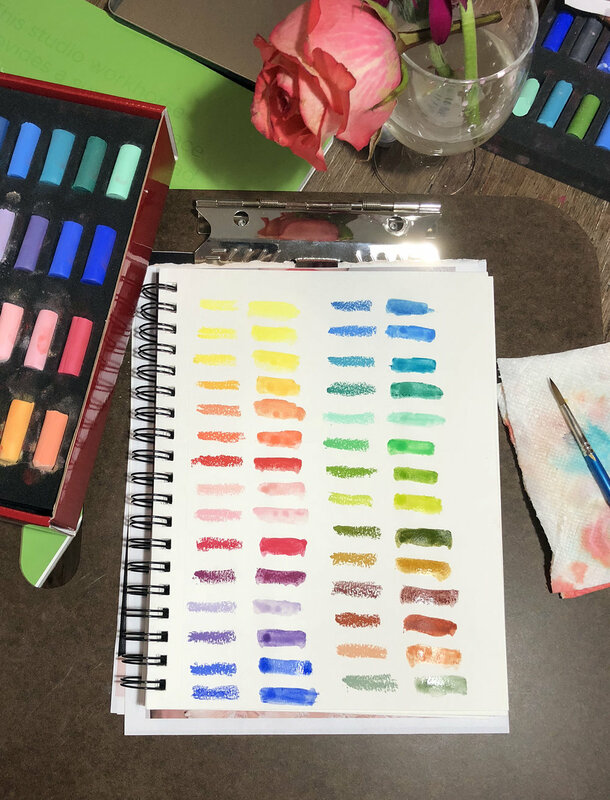 Here are the steps I used to make this watercolor-look planner dashboard. Watch the video below to see each step in action! Print or draw your image onto your watercolor paper. I used Canson paper. And here is the image I used if you'd like to download it for yourself. Trim your paper and plastic cover (if you aren't using a pre-made one) to the size of your planner. Draw on your freezer bag or plastic sheet using the Tombow Dual Brush Pens. They're water soluble so you can blend them really nicely with water! Drip or spray water onto the plastic bag or sheet you just colored on, then carefully turn it over onto your watercolor paper. Press the plastic down onto the paper to make the colors run together and give you the watercolor effect. Remove the plastic and wipe it off for future use. Let your paper air-dry, or speed up the process with a hairdryer on low. Punch holes in your paper and plastic cover (being careful not to tear it if it's thin) and insert into your planner! You can now put your sticky-notes and pieces of your favorite washi tape on your plastic cover for easy access. If you'd like to learn how to make time-lapse videos of your own art, check out my online class. Leave me a comment and let me know if you can think of other uses for this watercolor-look technique! And if you make your own planner dashboard, tag @BrownPaperBunny on social media so I can see! I've been busy creating some new illustrations this week, and filming time-lapse videos of the process. You see, I get asked all the time how I create and edit my time-lapse art videos, so I created a step-by-step class to show you how to make your own! And the best bit is that you can do it all on your phone, oh, and you can finish the whole class in less than 30 minutes! I contribute the majority of my growth on Instagram to time-lapse videos. While Instagram rarely promotes my photos to the discover feed, my time-lapse videos end up there all the time. This means that instead of a shelf-life of around 24-hours, my video posts end up bringing in new likes and followers for months after I post them! Most recently the super simple video below (which I created in about three minutes while listening to a speaker at a conference) has been viewed over 2.4 Million times and brought me over 5,000 new followers in less than a month! The editing part is really easy too. Check out the example video below. In about one minute I brightened it, got rid of the dark corners, edited out the shots where I leaned across my work or was using my hairdryer to dry the paint, and added in some side angle footage! AND I did it all on my iPhone! If you're interested in checking out the class, click the button below! Leave me a comment and let me know if you ever film videos of your process. It's MerMay, so how could I not create a fashion illustration of this beautiful mermaid dress Blake Lively wore to the Met Gala a couple of weeks ago. I haven't had a lot of time in my studio since Baby Amélie came along, but I've been getting some time on my iPad Pro while she naps — so I created this illustration using Adobe Draw (I like it for drawing vector art) and added a watercolor splash as a background. Do you have a favorite app for digital drawing? I was recently given a copy of Be the Shoe and a chance to interview Kathy Kelada, author of the book. Kathy is a personal stylist, turned life coach, living in LA. She’s spent years helping women achieve their goals, and look good while doing it! In her new book she helps you discover what sort of shoe you are now, and what shoe you are ultimately meant to be, and helps you realize that if you want a change, you can shift your habits and identity. And what woman can’t relate to a good shoe metaphor! Once you’ve identified what type of shoe you are, Kathy gives you exercises to do (with your real-life shoes) to help you assess your next steps. The book itself is absolutely gorgeous. It was illustrated by the talented Bridget Davies, is covered in silky material, and has fold out pages for each of the different shoe types. I interviewed Kathy to find out more about the book, her advice, and also the illustration process. 1. You mention in the book that you’re a Strappy Sandal, has that changed over the years? I’ve worn a lot of different shoes through my life, as do we all. But when it gets right down to it, I have always been a Strappy Sandal. I find my decision-making is mostly yes, before no, I’m usually open to possibilities, and I am a collector of beautiful things. 2. If you had to pick just one, which pair of shoes in your closet is your favorite? Tell us why. I’d have to go with a pair of leopard strappy sandals that I found when I was living in Vermont. They were a constant reminder to me that even though I was living in a cold environment where they were almost never appropriate footwear, they were the essence of me!! 3. Apart from finding the perfect pair of shoes to help you get there, what would you say is the next most important step to take in achieving a personal goal? I always tell my clients that awareness is 80% of change. It’s so important to KNOW: what you want, what’s stopping you, what steps need to be taken, what we feel about our goal, and most importantly, what we’re WILLING to do to get there. 4. What three things can we all do to really embrace our shoe characteristics? First, own your shoe – be comfortable with who you really are. Second, step into it – make choices from your strengths. Third, be open – life is always changing so we must be flexible and use all our shoe traits to our best advantage! 5. Do you often find yourself thinking about the lives and personality traits of women you see walking by, based on the shoes they are wearing? Yes, I have to admit I am always watching how different women behave in their shoes. It’s become a fun pastime! I am getting really good at naming their shoe now based on behavior and little clues I pick up. 6. Having moved away and then ultimately returned to LA, what advice can you give those ladies who love where they live, but realize it may not suit who they are inside? One thing I promised myself when I returned to LA was that I was going to make time and put effort into the things I had missed the most while I was living in Vermont. I make time to drive to the beach for the sunset, eat outside whenever possible, talk to strangers and share a moment, etc. There’s positives and negatives in every location but we can bring those into focus with a little awareness! If you don’t like things the way they are, change them. I’m not saying to make a huge move to another city, but rather to seek out the things you need and want in the city you’re in. 7. Can you tell us about the process of choosing an illustrator for your book? Did you already have a particular style and/or Bridget Davies in mind while you were writing it? When I was writing the book, I wanted illustrations that enhanced the emotional connection I hoped the book would convey. I saw Bridget’s illustration of blue shoes on a blog I follow and knew immediately that she was the ONE. I never pursued anyone else from that moment on. 8. With Bridget based in the UK and you living in LA, how did you work together to bring the book to life? Did you meet in person at all, or did you work exclusively via email, Skype etc.? I contacted her via email and made arrangements to meet her for the first time at a London Airport while I was traveling in Europe. We sat and exchanged ideas and the deal was sealed. From then on, we worked via Skype and email with only one other meeting (over tea) in London throughout the entire process. She is an amazing artist and she just kept inspiring me. 9. Did the illustrations and the book overall come out as you initially envisioned or did it change along the way? The illustrations were Bridget’s artistic style from start to finish and while we changed a specific shoe shape here and there, her artistry is what I relied on and trusted throughout the process. She provided me with so many beautiful images that the hardest part was deciding which ones NOT to use! I am so fortunate to have had her working alongside me in this creative project. Be the Shoe would make a great Mother's Day gift, and is available here. This year I'm participating in The 100 Day Project, which is designed to encourage you to be creative for 100 days, and build it into your everyday life as a solid habit. It's a little ambitious seeing as we have a newborn at home, but I needed some 'me time' every day, even if it is just five minutes between feeding, burping, doing laundry, and then starting all over again. 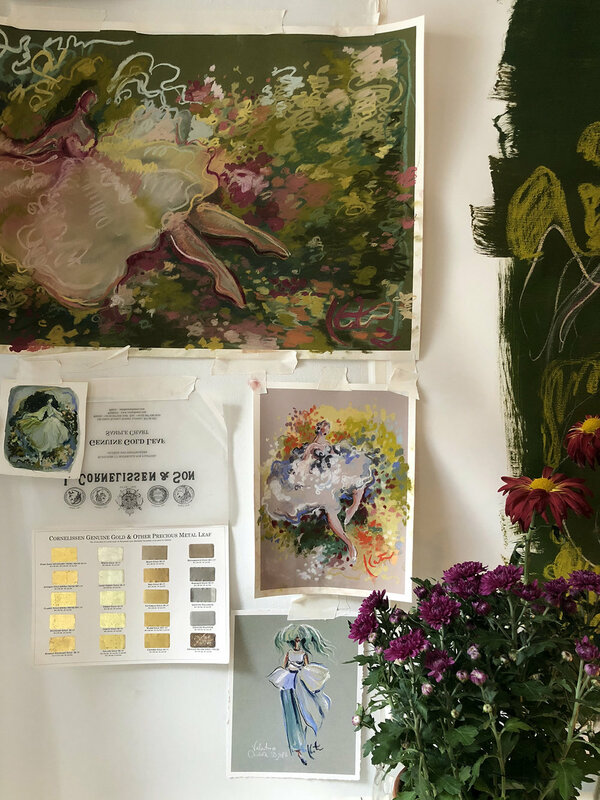 I picked the fairly general theme of 'flowers' to give myself plenty of room to experiment with different styles and mediums, and knowing that often I won't have more than a few minutes each day to dedicate to the project. Here are a few of my daily creations so far. I'd love to know if you're doing The 100 Day Project this year, or if you've ever done anything similar. Leave me a comment and let me know what you thought of it. Thank you to Famous Footwear for kindly sponsoring this post. This post also contains affiliate links, which help pay for the upkeep of this site. That being said, I will never, ever promote anything I am not 100% in love with! I've never told my story publicly. It's hard for me to talk about things this personal. But when Famous Footwear asked me to be part of their #StepForward campaign I decided it was time. I hope that my story will show other women that there is always opportunity to change your path, no matter how old you are, how broke, or how scared. Growing up with a single mom, and very little money, I watched her struggle to give my sister and I every opportunity — even if it meant paying for ballet class with handfuls of change, or hitchhiking to get into town when the car was broken down. Of course she never let us know how tight money was or how often she went without to provide for us. I am so incredibly thankful for her, and the childhood I had. I was loved, and it made me independent, ambitious, and determined to make my own way in the world and always have enough money to support myself comfortably. So I got myself to college, paying my way by working 40+ hours a week at a local supermarket while studying full-time, got good grades, took internships, and found myself a corporate job before I'd even graduated. I wasn't taking any chances. For almost 17 years I worked my way up through corporate life at big defense contractors, management consulting and legal firms, then moved into consumer electronics and the tech industry. I saved, I went back to school and got my Masters while working full time, then another degree, then another. I never stopped learning, working, saving. There were jobs where I traveled for seven months of the year, jobs where I worked over 100 hours a week for months on end, and certainly times where I slept in the office when there were deadlines to be met. I shared houses with lots of other (sometimes horrible) people to keep my rent low so I could pay off all my school debts, I never bought anything I couldn't pay for in cash, and I started side hustles along the way. I did wedding photography on weekends, joined dance troupes and performed at events, and worked the 9pm to 4am shift at cocktail bars so I could still get up in time for my day job. In my mid thirties I'd consider myself pretty successful, and say 'I'd made it'. I was running a department for a billion dollar consumer brand, and killing it. I was married to the love of my life, living in a big house, driving a BMW, and had no debt. But something had started to change, and I wasn't really very happy. 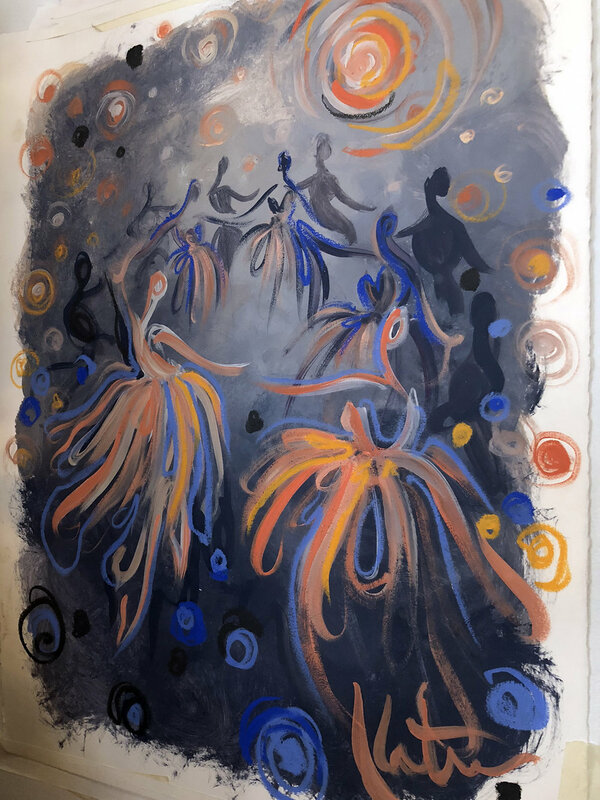 I'd only begun exploring my creativity a couple of years before, and I was finding more and more joy not only in painting and illustrating but in being a part of the creative community. I found myself getting an almost physical itch if I hadn't had time to make anything in a few days, and the achievements in my corporate life seemed less and less important to me. I daydreamed about being an artist and illustrator full time, but something inside screamed at me that I had to earn lots of money or I'd find myself back in my childhood, scrounging for change in the back of the sofa. I was too scared to take my dream seriously. Then our lives changed overnight. The company that both my husband and I worked for (and had just been promoted at) downsized in a big, and very unexpected way. The whole executive team was gone in one hit, almost everyone at a Director level and above was marched out without any notice, hand-over, or chance to say good-bye. Our whole world was turned upside down in a day. We went from having VERY good salaries to being a zero-income family. My husband, who was on a work visa, sponsored by the company, had to go back to Australia immediately, while I stayed behind wondering how to sell everything we owned, the house we'd just bought, our cars, to pack up our lives and go back to Australia. We'd moved countries for this company, we'd given up our lives, friends, family, and worked tirelessly for them for years. I just kept thinking, how could they do this to us? To top it off we'd just found out I was eight weeks pregnant with our first baby. I'll never know if it was biology or all the stress and heartbreak from that time, but I miscarried. It completely devastated me. Since the day we met, my husband and I had never been apart for more than a week or two, so the months that we had to spend on other sides of the world was horrible. We were having trouble seeing a way forward, but we never stopped trying, brainstorming, coming up with alternate plans and ideas. Then a close friend here in the US stepped in and sponsored my husband's visa to come and work for his company. It was a fraction of the money we had been used to, and I still wasn't working, but it was something. I was getting my husband back. For the next few months I worked hard to build up my own consulting business from home, while my husband commuted from Colorado to San Diego every second week for work. I was just so done with working in the corporate world and having to report to short-sighted people with no vision, who didn't share my drive, or appreciated how much work their teams put in to make them look good. I started crafting the life I wanted. Fewer clients, cutting our living experiences so I could work less hours and have more opportunities to work with people I really wanted to help ... other creatives. I wanted to use my years of experience to help other people like me make a living being creative, on their own terms. Miraculously we got pregnant again. But instead of feeling joy, we were scared. Would we miscarry again? How would we support our family on our reduced income? But we made the conscious decision to just keep stepping forward and figuring it out as we go. Because despite our life being at its 'messiest' we're moving in a much more positive direction, and taking more control of our lives rather than letting our bosses, corporate aspirations, or outside forces dictate where we go next. These days I'm working from home as a Social Media Consultant and Artist, and loving the freedom it affords me. Without all the distractions of an office, I get a whole day's worth of work done before lunch, and have more time to create, and help others. Our baby girl is due within the next two weeks, and we're working on getting my husband residency. As hard as this time has been it has really opened my eyes to new possibilities, and somewhere along the way I've given myself permission to be me, without any apologies. It has been freeing, and I've never been happier. So to me, Stepping Forward means never giving up. Some days they're only small steps, some days huge, but you've got to keep moving in the direction that will help you create the life you want. Everyone's journey is different and you've got to find the pace and direction that works for you. Don't be afraid to make a change, or to pursue your dreams even if they feel unattainable right now. Just start moving towards them. As part as the #StepForward campaign I've done a lot of thinking about my journey and just how grateful I am. If I can even inspire one other woman to take a step towards her own dreams, I'll be supremely happy. So here's how I customized the Converse All-Stars that Famous Footwear sent me, and made them my own. A year ago I might have painted them in black and white, but now they are full of color and gold and whimsy! I started with white Converse All-Star Low-Top Sneakers, and removed the laces. I used a combination of Tulip Soft Fabric Paint and Sharpie Fabric Markers to customize my kicks. I let each color dry for 15-20 minutes before starting on the next, and once I was done painting the shoes I let them dry overnight before touching them too much. I painted the shoelaces as well, one in gold and one multicolored and hung them up using bulldog clips and string overnight to let them dry. After about 24 hours I re-laced them and I was good to go! Do you ever customize your shoes, clothes, jewelry to be more 'you'? 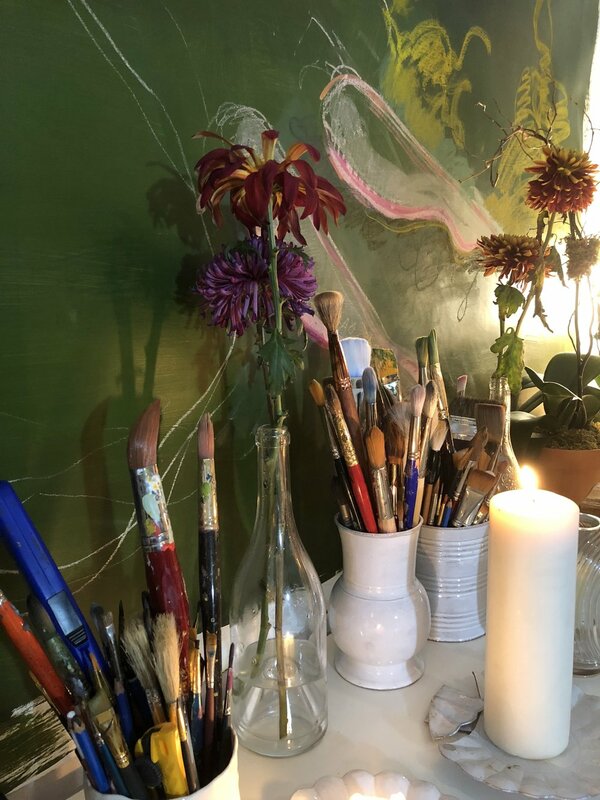 This month there are a lot of artists and makers participating in a monthly challenge to 'Meet the Maker' by sharing different aspects about themselves and their work. It's really fun and I'm learning so much about my lovely online friends! I've been crazy busy trying to wrap up a lot of work and projects before Baby arrives, so I'm picking just a handful of prompts to post about, but here they are so far. I'm an Aussie Artist, Illustrator and Social Media Coach living in Colorado. I'm addicted to watercolors, fashion illustration, and bright colors. Things you may not know about me...I used to drive tanks for a living, I've owned more motorcycles than cars, and I only started drawing when I was 31. I'm also really passionate about teaching other creatives how to use social media and online marketing and branding to their advantage. My favorite thing to make? 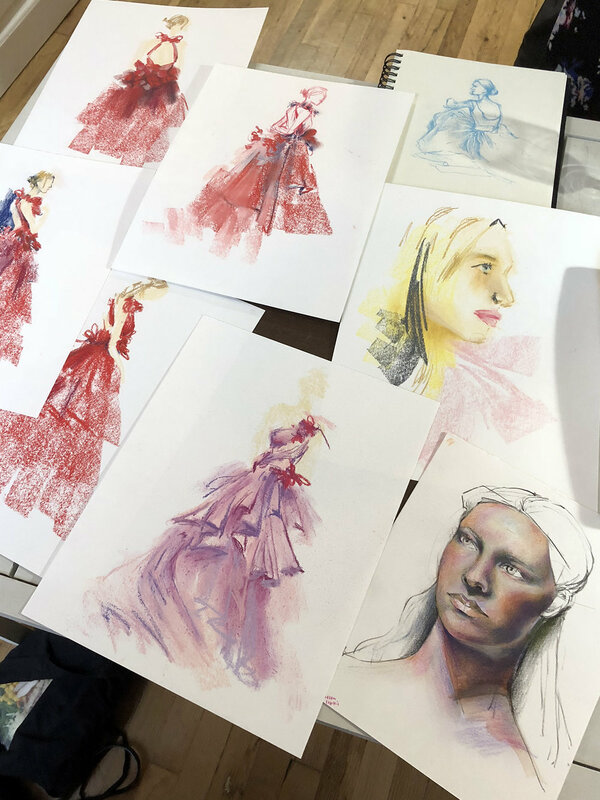 Fashion and lifestyle illustrations with watercolor, ink and mixed media! Leave me a comment and tell me what your favorite thing to make is! I'm lucky enough that in our new-ish house my husband and I each get our own workspace rather than having to share like we have in the past. Mine is all color and light, and his space is filled with black leather chairs, dark wood, concrete planters, and black screen-printed art and posters. Even though I have my own studio I still end up working on the kitchen table quite often because the back of our house looks over the foothills of the rocky mountains in Colorado and I love to take breaks and just look out at the sky, the mountains, people fishing in our little lake, and the sunsets have been magical lately! Most often I use watercolors, Tombow markers (affiliate link to the specific ones I like best) and liquid ink, gouache, and acrylic paints. What tools of the trade do you use? I love posting time-lapse videos of my art so people can see how I put it all together. I also love seeing other people's processes, sketchbooks, and works in progress! Here's one of my recent illustrations from start to finish. Here's a little video of my sketching some repeating patterns in my Sketchbook Project. You can see the finished book here. I'm recommending my lovely online friend Anika from @AisforAnika. She makes the most wonderful hand-drawn (and now digital) patterns and artwork. I am a BIG fan of both sending and receiving mail. With most of our family and friends living overseas we send quite a bit of it. And I love sending mail so much that I was a scriptist for Punkpost (but am on break now until after the Baby arrives). As well as painting and illustration I count photography as one of my creative passions. My husband and I love to travel and I've been fortunate enough to go all over the world for both business and fun. You can join my travel adventures over at @SweetDivergence if you're interested. This photo was from a trip we took up to Aspen in the fall two years ago. I count myself super lucky to have found so many creative friends 'in real life' as well as many more online. I cherish them all dearly. If you'd like to participate, you can jump in at any time, and here is the list of daily prompts. It's Mardi Gras and Shrove Tuesday (also known as Pancake Tuesday), so how could I not celebrate with some pancakes and a little illustration, complete with giant glitter pieces! I used Tombow Dual-Tip Brush Markers with water and a paintbrush (you can read more about that technique here) along with Mono pencils and erasers to create this piece. I finished it off with some hexagonal glitter in giant and regular sizes. It's tricky to glue it down in individual pieces, but with a bit of patience you get a fun sparkly effect. Here's a timelapse video of it all coming together. And the pancakes? I made orange and almond pancakes with orange-infused maple syrup and toasted almonds on top. I also sweetened some light sour cream with confectioner's sugar and fresh-squeezed orange juice to serve with fresh strawberries. Delish! Did you make pancakes today? Creating content for holidays is idea number five on my FREE, downloadable guide '21 Social Media Prompts for Artists'. Grab a copy of the guide here, to give your social media content a kick in the pants and stop feeling stuck for what to post!